With the rise of different diseases, health awareness is an indispensable program that we can provide nowadays. This is essential to promote knowledge, prevent some diseases, and reduce the number of individuals who have chronic illnesses. 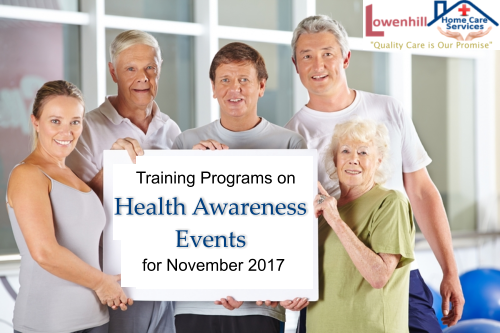 We at Lowenhill Home Care Services will conduct training programs for the whole month of November this year. Our focus will be about the various aspects to consider to have some knowledge on common health issues. The goal of this course is to advance health awareness for every individual and family in our community. We have listed the diverse health topics based on the awareness themes for this month. The checklist includes the websites that have the specialization on a particular health issue and how you can connect to them. As we strive to deliver quality care to our customers’ home, we have provided this opportunity not only for the participants to learn but also for us to grow. Our management is continually making ways to develop our staff members and caregivers so we can serve our clients better together with their families. It can enhance the provision of care and support. It is a great source of new information. It can build confidence among care providers. It can help the agency to keep in compliance with the standards, rules, and laws on health care. It can lead in providing a brighter future for the home care industry. Here at Lowenhill Home Care Services,we provide ways to improve existing knowledge and promote awareness, learning, and personal development. Contact us at 724-788-1072 extension 1 for details.